Confirmed Uruguay 23 Men Squad: Uruguay confirmed their 23-man squad for 2018 FIFA World Cup and three MLS based players are ommited from the squad in Nicolas Lodeiro, Gaston Ramirez and Fede Valverde. Below is the entire squad of Uruguay. Uruguay qualified for the world cup 2018. 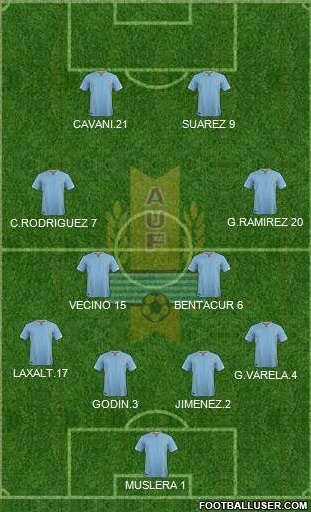 The team is head by coach (Óscar Tabárez) who is incharge since 2006. Under the coaching of (Óscar Tabárez) won Copa America title in 2011 after his team defeat (Paraguay) in the finals. He is the only coach in the history of Uruguay football who qualified for three consecutive world cup 2010, 2014, and 2018. Tabarez is among the experience coaches in the world cup 2018. Possible Starting Lineup: Atletico Madrid defender (Diego Godín) will captain the team in Fifa world cup 2018. Luis Suárez and Edinson Cavani form a key partnership upfront and we can expect the duo to start in old fashion 4-4-2 formation. A flat four midfield of Rodriguez, Vecino, Bentacur and Ramirez is expected to provide the much needed shield for the back four and have control in the midfield. Godin and Jimenez are expected to start in central defense while Varela and Laxalt to play as full backs. Muslera is the first choice goal keeper. Team of Uruguay drawn in Group (A) of world cup 2018 alongside Saudi Arabia, Russia and Egypt. They will play their opening match match of world cup against (Egypt) on 15th June. Óscar Tabárez hopeful make it to the knockout rounds this year again.